Everyone deserves lifestyle options. Everyone should have the chance to choose the life they want to live. However, when the life you choose is the kind of lifestyle your health can no longer support, it may be time to turn to professionals for help. This kind of situation commonly occurs during any transition. When the years turn in numbers, your independence may decline – but this doesn’t mean that you should limit yourself. Find a home that you can truly call HOME. Welcome to Safe Haven Home For All. Safe Haven Home For All is a group of personal care facilities offering compassionate care from our various location in Georgia. We are owned and managed privately and lovingly full staff. Our home provides supportive care 24 hours a day, 7 days a week. The retirement life that you envisioned for yourself or a loved one is the kind of life you will surely find at Safe Haven Home For All. We are situated in a peaceful neighborhood. 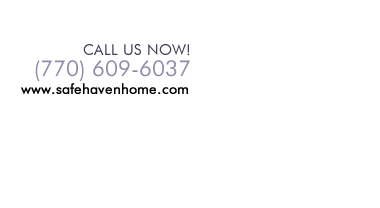 Safe Haven Home For All is fully-staffed with qualified caregivers and managers who provide excellent assisted living services. We also organize enriching activities to promote good health and wellness for our residents.